Among other improvements and changes that come along in iOS 8, Apple introduced interactive notifications that let you take actions on push notifications right from the notification banner or alert without losing focus from the app you’re in at the moment. Pushwoosh has recently added so-called iOS Categories that allow you to create custom push buttons right from your Pushwoosh Control Panel. First of all, you should create a Category in your Pushwoosh Control Panel. A category contains either one or two buttons. 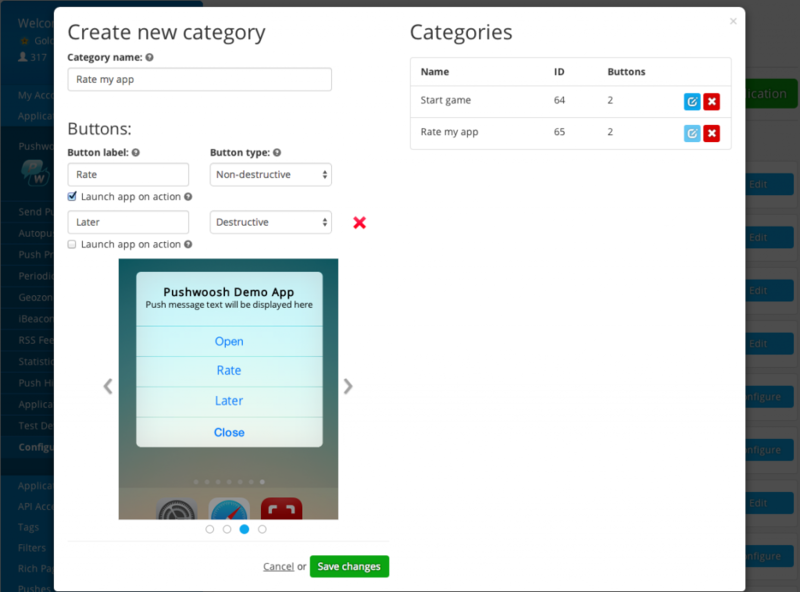 Open a Configure page of your application in Pushwoosh, and click the Edit Actions button. Give a name to the Category you are about to create, you will use it for your further reference. Specify the text which will be used as a button label. iOS displays up to 2 lines of text. Destructive – the button is red, signifies actions such as delete, reject, dismiss, etc. Non-destructive – the button is blue, signifies positive actions. Choose whether you would like your app to be launched in the foreground when a user taps on the button by enabling the “Launch app on action” checkbox. Click “Save”, and it will be saved in Pushwoosh with a Category ID. These Categories are now available on the device, so they can be properly displayed when a message arrives *and your application is not running in the foreground*. When a push message containing a category ID arrives, Pushwoosh SDK displays the notification with a set of buttons this category contains.